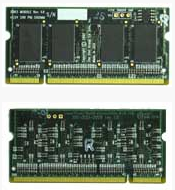 DNSODM_DDR3 is a SODIMM module compatible with the SODIMM sockets in any DN9000K10, DN9002K10PCI, DN9000K10PCIE8T and newer FPGA boards. It provides 512MB of memory using the DDR3 memory interface. The board operates at 1.5V, and as such, only FPGA boards supporting this low voltage can operate this module.